Washington Square had transformed, by 1842, from a potter’s field to an exclusive residential neighborhood bordering what was now an elegant park. That year the congregation of the Sullivan Street Methodist Protestant Church just to the south decided to disband and sell its property. Oliver Loveland, a young and prominent member of the Bedford Street Church, admired the structure and convinced other members to purchase the old church. Then, just as the papers were to be signed, several of the major supporters backed out, fearing the project would fail. Loveland was undeterred, however, and “Almost alone, assisted only by Dr. S. A. Purdy, he purchased the property for the stipulated price, the two becoming personally responsible for its payment,” reported The New York Times. It was a risky move. Neither of the men was financially able to maintain a new church organization, let along the mortgage. “Both of the new owners were at the time of slender means,” said The Times. Financial salvation came in the form of Sylvanus Gedney, a member of the old Sullivan Street church whose “love of the old edifice was too strong to part with it.” On December 12, 1842 the three men founded the Sullivan Street Methodist Episcopal Church with just one other member, Richard P. Berrian. In 1859 a “more commodious edifice” was necessary to accommodate the growing, upscale congregation. The pastor, Dr. Shelling, purchased two lots at Nos. 133 and 135 West 4th Street, just off Washington Square, and began plans for an elegant new church. Although often mistakenly attributed to Charles Hadden, the church was designed by architect Gamaliel King and was possibly his first commission after dissolving his partnership with John Kellum. The white marble building was completed two years later at a cost of $80,000—about $1.4 million today. A successful melding of Gothic and Romanesque Revival styles, the façade was divided by four slender buttresses, capped by marble finials. Inside, King installed the first galleries in New York to be built with no visible means of support. The innovative engineering caused nervousness among the congregants and The Times later reported that “skeptics in the congregation said the galleries would fall down in a couple of years.” Happily, they did not. With its new location the church was renamed the Washington Square Methodist Episcopal Church. The scattered congregation came from Jersey City, Greenpoint, Harlem, Elizabeth, Hoboken, Williamsburg, and “from all parts of the City,” according to The New York Times. In October 1884 the church trustees started a thrust to eliminate its $11,100 debt, including a $3,100 mortgage. Subscriptions were raised and the money was paid to Treasurer Edward F. Stewart. By December $5,000 had been raised and in March 1885 Stewart noted in the ledgers that the mortgage had been paid. The problem was that the money went into Stewart’s pockets and not to the mortgagor, James M. Anderson. “The defaulting treasurer, however, was very careful to pay the interest on the mortgage from his own pocket, so that his rascality would not be revealed,” said the Evening World. Stewart managed the deception until March 15, 1888 when a notice that an interest payment was due fell into the hands of Pastor John Rhey Thompson. “The information fell like a dynamite bomb among the officials of the Washington Square Methodist Church, who had looked upon their treasurer as a man of strictest integrity only to find him an ingrate and a thief,” said the newspaper. Years before Stewart began his rascality, 20-year old Englishman Martin George said good-bye to his girlfriend of four years and traveled to California’s gold mines in 1877. He and Caroline Jenkyn maintained a long-distance romance via mail for over 11 years. Finally they decided to meet half way, in New York, to be married. George boarded a transcontinental train and his fiancé set sail on the Gallia from Liverpool. On May 30, 1889 the Gallia docked in New York and Martin George was there to meet her. Shortly before 8:00 that evening the couple was brought to the Washington Square Methodist Episcopal Church by John Stevens, an officer of the Gallia. After almost 12 years and a joint 6,000 mile trip, they left the church as Mr. and Mrs. George. Nearby on Washington Square sat the noble Gothic revival Asbury Church. 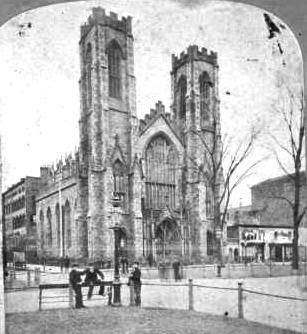 On October 9, 1893 the two churches merged and it was announced that the venerable stone structure on the park would be sold. The proceeds of the sale would help advance the charitable causes of that both churches supported. Within two years the church building was demolished. 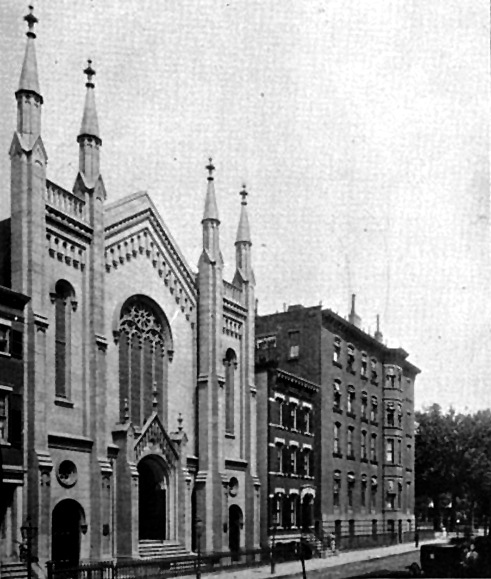 The Washington Square Methodist Episcopal Church, so long recognized for its quiet existence, was about to change its reputation. The church entered the 20th century by plunging headlong into political issues. It started with liquor. By now the Greenwich Village and Washington Square area had drastically changed. In 1962 the membership numbered only about 50 with nearly no young people. The population of Greenwich Village was now heavily Italian Catholic, remainders of the great immigration wave at the turn of the century, and it had become the center of New York's homosexual community. Yet the tiny congregation still embraced its fervent interest in equal rights and political justice. In 1969 when the National Black Economic Development Conference demanded “reparations” to atone for centuries of white oppression of Negroes in America, the church withdrew $15,000 from its meager $40,000 bank account—the first predominantly white congregation to contribute. The congregation would prove its forward thinking once again when the Rev. Paul M. Abels took the pulpit as pastor in 1973. Four years later Abels openly declared his homosexuality as he began conducting “covenant” ceremonies for gay couples who were legally barred from marriage. The admission created a firestorm within the Methodist Church, but not within his congregation. Fully 100 percent of the letters from church members to Bishop Ralph Ward were in support of Abels; there was not one dissenting voice. But critics, ignoring Abels’s exemplary service to the community and the church, turned instead to a biblical admonishment against homosexuality. They called for his dismissal. When the regional New York Annual Conference voted in favor of the minister, the bishop appealed to the national Judicial Council, the highest court in United Methodism. In 1979 it ruled that Abels was in “effective relation” and “in good standing” and should remain as pastor. Abel would take an early retirement in 1984, but not before he began an aggressive $1.5 restoration fund raising campaign and saw the inauguration of a parent-run day care center, the Harvey Milk School for gay teens, and planned the church’s 125th anniversary. Abel’s restoration, which began in 1983, was done under the supervision of Andrew Ladygo of the Boston-based Society for the Preservation of New England Antiquities. Much of the attention was focused on the interior. “The ceiling is a canopy enclosing the space and the primary, most dramatic feature of the structure,” explained supervising architect Ann Beha. Not that it would matter much longer. In the Fall of 2004 the struggling congregation gave up and sold the church it that had been its home for nearly a century and a half. The developer was restricted from demolishing the building because it sits within the Greenwich Village Historical District. But within two years the pre-Civil War interiors had been gutted and the church had been renovated into apartments. Although landmark status preserved the magnificent white marble façade, it could not stop the architectural and historic sacrilege inside. A truly sad story that such significant and historical works are now made into a façade for apartments. It reminds me of the door the monks cut in The Last Supper, but at least they preserved the bulk of the painting.It's reminiscent too, of churches in the USSR made into warehouses. What will America do in a post-Christian world? It will wither. It's as if a whole culture decided to commit suicide so as to hide from it's enemies. Sacrilege is the right word. Huh? What's this about a "post-Christian world?" Civilization was humming along for about 9,000 years before the alleged birth of Christ and will likely continue when Christianity has gone the way of Mayan & Aztec religions! I have fond memories of this church when in the late 60s several youth groups that I led from West Virginia camped out for 6 days at a time in the church. I was attracted by the church's reputation as "The Peace Church," which we found was a deserved title. The people were welcoming, & though their number was small, their Sunday morning worship services were lively. At first the teenagers complained about the messiness of the area, teeming with people very different from any they had met in WV. T hey liked the neat cleanliness of mid-town Manhattan. However in a couple of days this changed as they experienced life in & around Washington Square, the friendliness & liveliness of the people contrasting with those scurrying back & forth in Mid-Manhattan. As one youth said, you could fall down "up there" & no on would notice as they walked over you. I am sorry to learn that the congregation has sold the building & that only the facade remains.